3-Creatine | Synergy of 3 Active Forms of Creatine | Buy Here! May increase muscle strength and hypertrophy. New formulation combining different forms of creatine for greater activity and much better digestive tolerance. Creatine supplementation has so far proved the most popular and scientifically-documented of the ergogenic substances used in the sports world, particularly for increasing muscle strength in short, intense exercise, stimulating protein synthesis, speeding up recovery and gaining muscle mass. Creatine is a derivative of amino acids naturally present in muscle, including meat. • Kre-Alkalyn which is a buffered form that is neutral for the stomach. What appears to be the most important aspect here concerns the solubility criteria, and that of tolerance of the product in the stomach, as well as absence of discomfort (gastrointestinal cramps from formation of a precipitate). In fact, the more water-soluble a form is, the better it is tolerated. Creatine is produced naturally in the body. It is essential for the production of ATP used by muscle fibres during exercise. When ATP levels collapse, muscle fatigue develops along with an increase in lactic acid. By supplementing with 3-Creatine, balance is restored in the muscles, allowing faster post-exercise recovery. 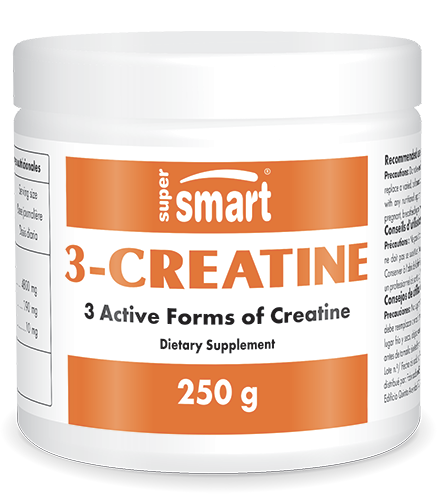 These three combined forms of creatine act synergistically with each other, thus offering rapid and optimal efficacy. What results can be expected from such supplementation? • At a physical fitness level. Athletic performance increases significantly during intense exercise. Highly-trained individuals are more sensitive and respond more effectively to creatine supplementation. According to scientific data, vegetarians and vegans have abnormally low blood levels of creatine. Supplementation may result in improved intellectual performance and memory for such groups. In people affected by the genetic disease autosomal recessive corneal dystrophy, which causes problems associated with hyperpigmentation of the choroid, taking creatine may lower the risk of them losing their sight. It may also improve symptoms of McArdle’s disease, a rare genetic disorder which develops in childhood. This disease is caused by muscle glycogen phosphorylase deficiency (glycogenosis type 5) and produces cramps and acute muscle pain. Taking high daily doses of creatine may help increase capacity for physical exercise and ease overall muscle pain. • preventing certain types of age-related deterioration in the body. The average active dose recommended is one 5 gram spoonful a day. Taking small doses at mealtimes with a large glass of water is recommended in order to maximise its effects. adults. Take one measure a day.